Bedford Blues launch their 2015/16 pre-season campaign this Saturday with a triangular feast of rugby against both Ampthill and Old Albanians. The Blues will open by facing National One opponents Ampthill at 2pm before taking on Old Abanians at 3pm. The afternoon will be rounded off with Ampthill pitting their wits against Old Albanians at 4pm, with all games lasting 40 minutes. 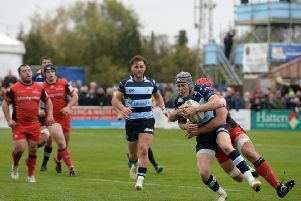 Tickets are just £5 for adults and free for U16s, and with so many new faces set to play it is a must-see fixture as the Goldington Road gates are opened for a fresh new season from 12 noon. After the rugby is done and dusted, the Bedford players will be hosting a pre-season party in the Blues Marquee. From 6pm there will be an evening of fun, games and live music as fans get the chance to meet the squad and coaches. Entry to the soiree costs £5 and includes a welcome drink on arrival. The players will also be sparking up the BBQ and selling burgers and hot dogs while the dress code for the night is beachwear. Following their visit to the Blues, Ampthill travel to Normandy to play Stade Rouennais in a pre-season fixture on Saturday, August 22. Rouen, coached by former England scrum-half Richard Hill, finished top of Pool 2 in Federale 2 last season and have secured promotion to Federale 1 – level 3 in the French rugby pyramid. The town is one hour east of Le Havre and two hours south of Calais.